NO! 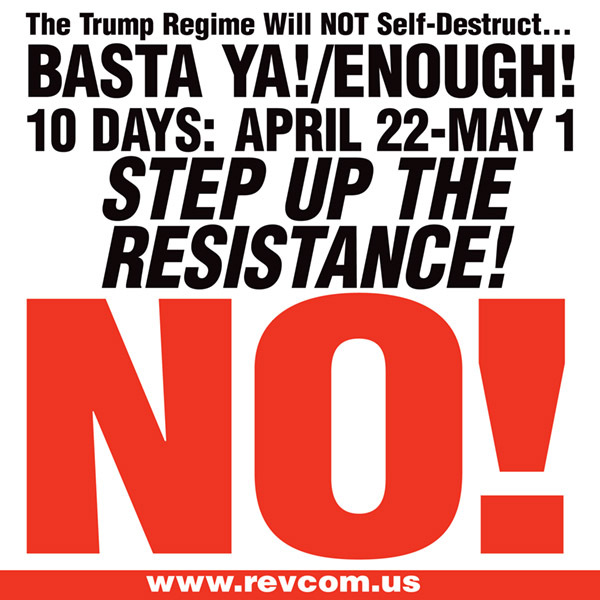 To Trump’s War Moves and Aggression—Drive Out This Fascist Regime! Imperialism means huge monopolies and financial institutions controlling the economies and the political systems—and the lives of people—not just in one country but all over the world. Imperialism means parasitic exploiters who oppress hundreds of millions of people and condemn them to untold misery; parasitic financiers who can cause millions to starve just by pressing a computer key and thereby shifting vast amounts of wealth from one place to another. Imperialism means war—war to put down the resistance and rebellion of the oppressed, and war between rival imperialist states—it means the leaders of these states can condemn humanity to unbelievable devastation, perhaps even total annihilation, with the push of a button. Imperialism is capitalism at the stage where its basic contradictions have been raised to tremendously explosive levels. But imperialism also means that there will be revolution—the oppressed rising up to overthrow their exploiters and tormentors—and that this revolution will be a worldwide struggle to sweep away the global monster, imperialism. On Wednesday, Trump ordered the dropping of the biggest bomb short of a nuclear weapon on Afghanistan. In March, the number of civilians killed by U.S.-led air strikes in Iraq and Syria rose sharply from the already-high previous total to as many as more than 3,400 people, four times the number from the previous month. Trump has flipped from flattering into threatening Russia and is now playing nuclear roulette with North Korea. On a very basic level, this is U.S. imperialism at work: using military aggression, and the threat of aggression, in its drive to ever more deeply exploit and plunder the planet and to dominate its chief rivals in that horrific endeavor. These imperialists kill people, wholesale, all the time. Some crow about it, some express regret, and some do both out of either side of their mouth. But they all do it. That is not new and whoever sits in the White House—be it Obama or Clinton, Trump or Bush—bathes in the blood that flows in Syria, Yemen, Somalia or dozens of other places every night. On another level, the current burst of aggression takes place in the context of a fascist regime attempting to consolidate power—one that is both fighting with other sections of the power structure and fighting within its ranks. The Trump/Pence regime came to power as one answer to the stubborn and difficult problems the U.S. confronts in enforcing that dominance. The logic of fascist regimes—regimes whose legitimacy rest on a hyper-nationalistic chauvinism and the presence of an invincible “strong-man” who virtually never admits defeat but always doubles down—drives very powerfully toward aggression and war. When you have a fascist strongman who has repeatedly raised the question of using nuclear weapons and of heightening the nuclear arms race… whose military budget is a war-fighting budget… who speaks only of American dominance and openly glories in and unleashes his followers around “America First”… this is extraordinarily ominous. Anyone who is telling you that we should aim at anything short of driving out this fascist regime is simply not coming to grips with how directly and dangerously the fate of the planet now hangs in the balance.